April-May 2018 Seminar with prof.ssa Simona Forti on "Il terrorismo nel XXI secolo. Concetti, proposte e prospettive", Università del Piemonte Orientale, Vercelli, PRIN 2015. 2017/2018 Adjunct Professor of ﻿International Relations, ﻿University of Turin. 2015, Adjunct Professor of Middle East Conflicts and of Security Studies at Centro Studi Post Conflict Operations (CSPCO) Turin. 2014, Adjunct Professor of Middle East Conflicts and of Security Studies at Centro Studi Post Conflict Operations (CSPCO) Turin. 2012/2013 Adjunct Professor of ﻿International Relations (advanced course) 2012-2013, ﻿University of Turin. 2011, Course for Associazione per Ricerca e Insegnamento di Filosofia e Storia (A.R.I.F.S. ), Brescia, in order to retrain Italian school teachers. 2009, Strategic Studies lessons on The debate over the "transformation of war". 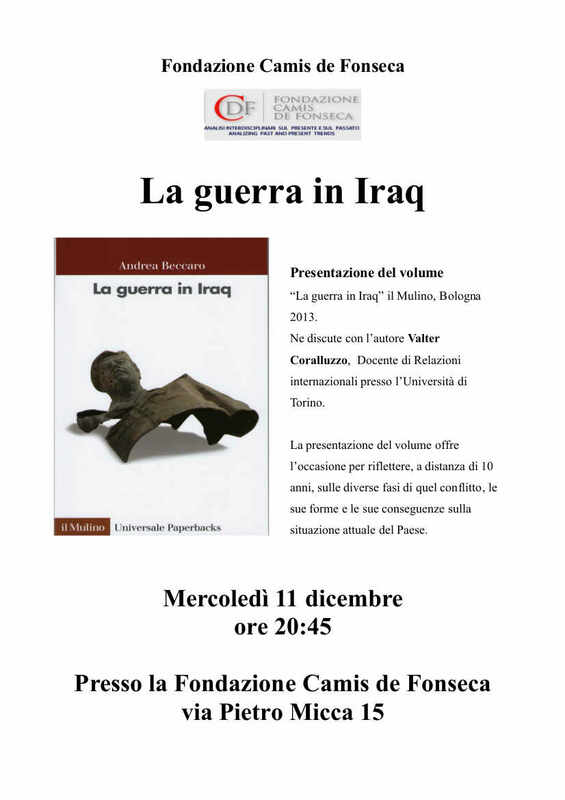 19th January 2018 Speaker at UPO, Università del Piemonte Orientale, Vercelli with Arturo Varvelli, ISPI: La Libia dopo Gheddafi: non solo ISIS. 25th November 2017 Speaker at UPO, Università del Piemonte Orientale, Vercelli: Il ritorno della Religione nelle Relazioni Internazionali. Tra Jihad e guerra al terrorismo. 11th May 2015 Speaker at ISPI: L'Italia e la minaccia Jihadista. Quale politica estera? with Fabrizio Coticchia, Istituto Universitario Europeo, Lia Quartapelle, Camera dei Deputati, Riccardo Redaelli, Università Cattolica, Arturo Varvelli, ISPI. 20th November 2013 Speaker at Società Dante Alighieri in Berlin: Per sempre soldati per sempre ragazzi. 13th June 2013 Speaker at Lugano: Iraq: 10 years later. 30th May 2013 discussant at ISPI (Institute for International Political Studies) on Strategia: la contaminazione di un concetto, with Professor Andrea Carati, Milan University, and Professor Luciano Bozzo, Florence University. 09th May 2013 Speaker at Dipartimento di Cultura, politica e società, Turin University: La guerra in Iraq. 14th September 2012 Speaker during the national congress of SISP (Italian Society of Political Science): La strategia americana in Iraq: RMA, COIN e Targeted killings. 12th September 2012 Speaker during the national congress of SISP (Italian Society of Political Science): Callwell and Small Wars. 01st December 2011 Speaker at Fondazione Einaudi in Turin during the national congress titled Le regole della battaglia and organized by CISP (Centro Interfacoltà per lo Studio sulla Pace). Title of my paper: Urban Warfare. 06th May 2011 Speaker with Professor Domenico Tosini, University of Trento, at the Department of Political Studies (Dipartimento di Studi Politici) in Turin: Le caratteristiche della conflittualità contemporanea: la guerra in Iraq tra insorgenza e attacchi suicidi. Title of my paper: L’insorgenza irachena. 2nd May 2011, Discussant at Department of Political Studies (Dipartimento di Studi Politici) in Turin: Le caratteristiche della conflittualità contemporanea: Afghanistan. Speakers: S. Ruzza, C. Bertolotti.